Bell Tower Park offers two heated pools and spas, a clubhouse and three miles of winding walking trails. Bell Tower Park’s convenient proximity to shopping and dining makes it a popular community. Its south Fort Myers location is also nearby the warm Gulf Shores, Naples and Bonita Springs. Bell Tower Park’s amenities are centered at their 6,200 square-foot clubhouse with a heated outdoor pool, fitness rooms, billiards and TV lounge. For outdoor recreation, enjoy a game of basketball or tennis on their outdoor courts. Outside of Bell Tower Park’s clubhouse area, there is an additional outdoor pool and spa, complete with restrooms, chairs, tables, and gas fired grills. 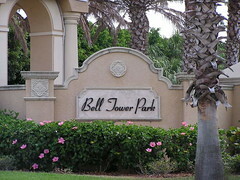 Bell Tower Park is an upscale, gated community of 518 carriage and courtyard homes built from 2003 to 2008. Bell Tower Park was developed by Grosse Pointe Development and sits on a charming 136 acres. Majority of the resale homes offer lake views and feature large, open floor plans. There are four floor plans offered with the carriage homes of Bell Tower Park ranging from 1,747 to 2,315 square feet. Carriage homes offer a first or second-floor residence that has at least two bedrooms and bathrooms, a covered lanai, and an enclosed garage. For a larger option, courtyard homes are also offered in two floor plans ranging from 1,146 to 2,429 square feet. Courtyard homes offer a one-story floor plan or a two-story floor plan. Most of the courtyard homes feature swimming pools and two car garages, two or three bedrooms, and at least two baths. The are three sub-associations in Bell Tower Park, and homeowners pay one low monthly fee to their neighborhood HOA to take care of community amenities and landscaping maintenance. The residences at Bell Tower Park are conveniently located close to I-75 in south Fort Myers, Florida. Situated just off of US 41, Bell Tower Park’s community is just south of the heart of shopping and dining at Bell Tower Shopping Center. Residents take advantage of sunny Fort Myers’ beaches because they’re just a short drive away. Sanibel and Captiva Islands and beaches are favorite daytrip locations for the residents of Bell Tower Park and trips to nearby Naples and Bonita Springs are also popular. Posted on September 12, 2013, in Real Estate and tagged 33912, Bell Tower Park, Bonita Springs Realtor, Cape Coral Realtor, Estero Realtor, Fort Myers Realtor, Homes for Sale in 33912, Kristen Pell, Property Guiding, Real Estate Biz, SWFL Real Estate. Bookmark the permalink. Leave a comment.